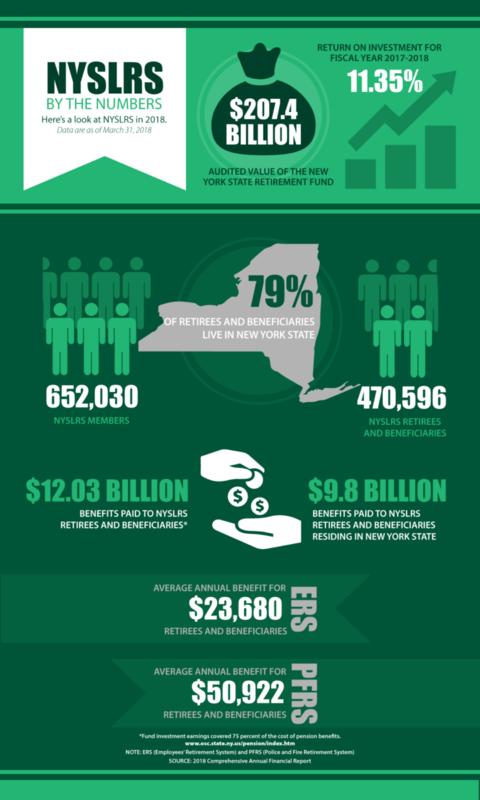 NYSLRS paid $12.03 billion in benefits to 470,596 retirees and beneficiaries during the state fiscal year that ended on March 31. Seventy-five percent of the cost of those benefits came from returns on investments of the New York State Common Retirement Fund (the Fund). The Fund was valued at $207.4 billion at the end of the fiscal year. The average return on Fund investments was 11.35 percent for the year, exceeding the long-term expected return rate of 7 percent. NYSLRS’ 533,415 active members (that is, members still on a public payroll) work for more than 3,000 public employers statewide. One-third of those active members work for New York State. The rest work for counties, cities, towns, villages, school districts and public authorities. Nearly 94 percent of active members are in the Employees’ Retirement System (ERS). The Police and Fire Retirement System (PFRS) accounts for 6 percent of NYSLRS membership. The average pension for an Employees’ Retirement System (ERS) retiree was $23,680; the average for a Police and Fire Retirement System (PFRS) was $50,922. 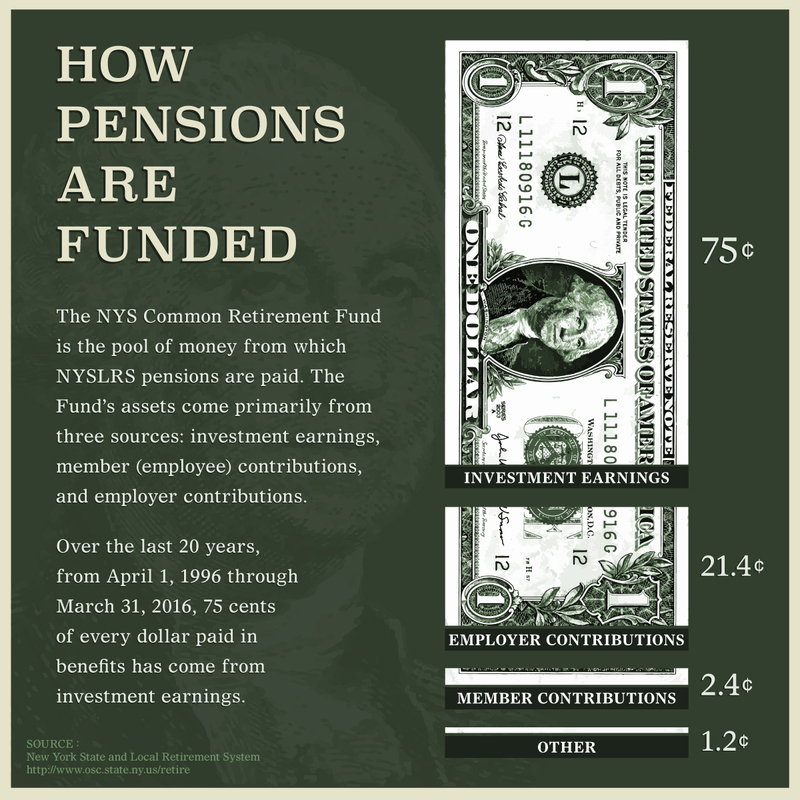 But NYSLRS pension payments don’t just benefit the system’s retirees and beneficiaries. Because 79 percent of NYSLRS retirees and beneficiaries live in New York, $9.8 billion worth of benefits stayed in the State. And that money supported local businesses, paid local taxes and generated economic development statewide. 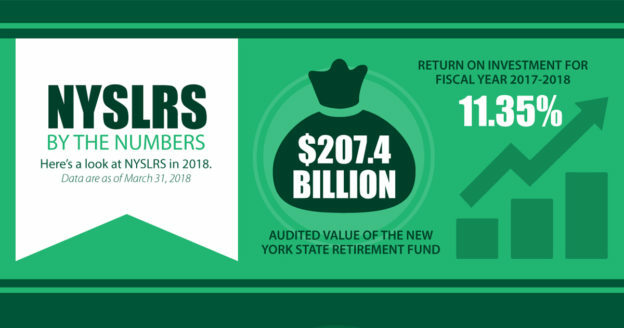 Extensive information about NYSLRS members and retirees, the Fund, and Fund investments can be found in the 2018 Comprehensive Annual Financial Report (CAFR). NYSLRS received a Certificate of Achievement for Excellence in Financial Reporting for the 2017 CAFR. The Certificate of Achievement is a national award recognizing excellence in the preparation of state and local government financial reports. NYSLRS has won this award for the last 14 years. Content last revised October 24, 2018. This entry was posted in General News, Pension System and tagged average pension, benefits paid, CAFR, Comprehensive Annual Financial Report, Economic Impact of Retirees, Employees Retirement System, ERS, fund investments, members, membership, New York State & Local Retirement System, New York State Common Retirement Fund, NYSLRS, NYSLRS Retirees, One of America's Largest Pension Systems, Pension System, PFRS, police and fire retirement system, public pension system, retirees and beneficiaries, return on investments, Strong New York, The Fund on October 24, 2018 by NYSLRS. Last week, we published the latest Comprehensive Annual Financial Report (CAFR). This annual report gives a clear view about how both NYSLRS and the New York State Common Retirement Fund (Fund) are managed. This year’s CAFR covers our last State fiscal year, from April 1, 2015 through March 31, 2016. Each year when the CAFR is prepared, we strive to make sure the data is accurate, complete, and clear. For example, the financial section was prepared in keeping with accounting principles established by the Governmental Accounting Standards Board, and reporting requirements outlined by the Government Finance Officers Association of the United States and Canada. These principles set standards for financial accounting and reporting. By following them, we can see how we compare with other government entities using the same standards, ensure our data is consistent between accounting periods, and provide reliable financial statements to the public. Comptroller DiNapoli is responsible for the Fund’s management. He ensures that investment policies and practices follow the highest levels of ethical conduct and transparency. The CAFR aids in transparency by providing historical data and extensive detail about the Fund’s audited assets, liabilities, investments, and transactions. As of April 1, 2016, there were a total of 647,399 NYSLRS members; 612,294 in the Employees’ Retirement System (ERS) and 35,105 in the Police and Fire Retirement System (PFRS). 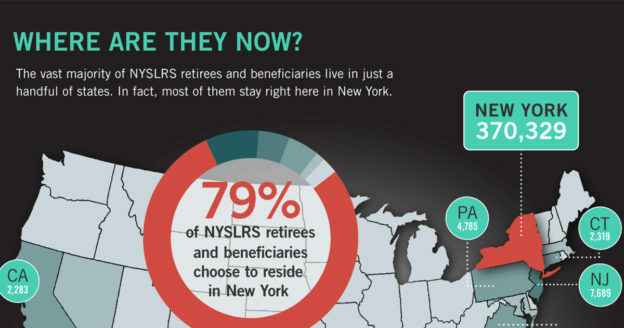 As of April 1, 2016, there were 440,943 NYSLRS retirees, 78 percent of whom live in New York. As of April 1, 2016, there were a total of 3,040 participating NYSLRS employers. The Fund has invested approximately $9 billion with minority- and women-owned business enterprises since Comptroller DiNapoli took office in 2007. 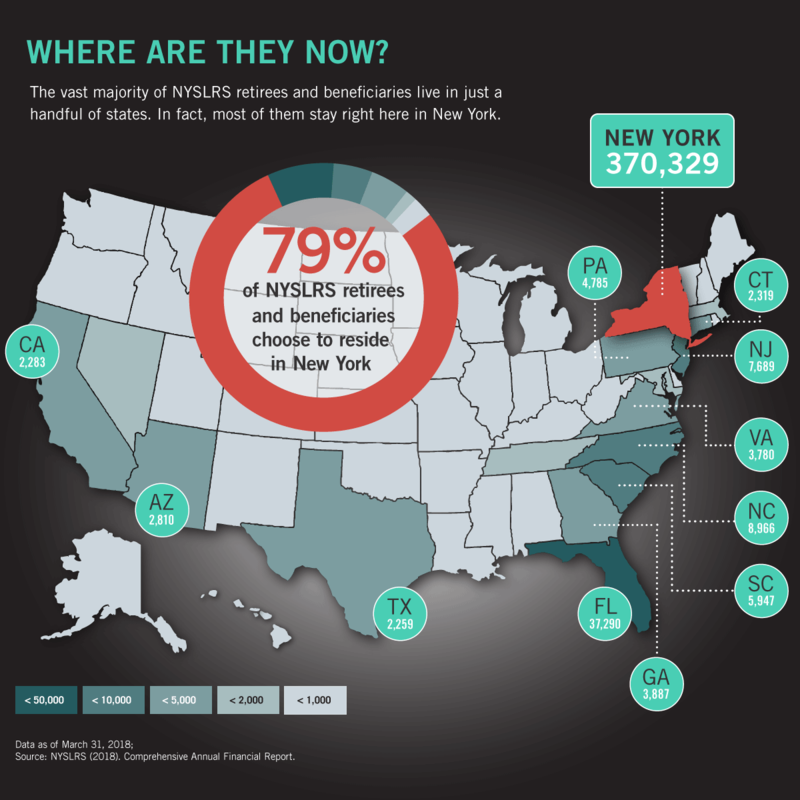 This fact sheet (PDF) summarizes many other NYSLRS statistics you’ll find in the new CAFR. You can also find back issues of the CAFR on our website. Content last revised October 6, 2016. This entry was posted in General News, Pension Fund and tagged CAFR, Comprehensive Annual Financial Report, Comptroller Thomas P. DiNapoli, defined benefit plan, ERS, GFOA, Information is the Key, New York State & Local Retirement System, New York State Common Retirement Fund, NYSLRS, One of America's Largest Pension Systems, PFRS, public pension system, Strength Through Strategy, The Fund, this public pension system works, Transparency, well funded, well run on October 5, 2016 by NYSLRS. If you’re a current NYSLRS member, you’re a state or local employee who works within New York State. But once you retire, you can spend time in warmer climates or move closer to family. However, we haven’t looked at the other 22 percent of our retirees and beneficiaries. If they aren’t living in New York, where have they gone? …and even as far as Alaska (currently 60) and Hawaii (116). 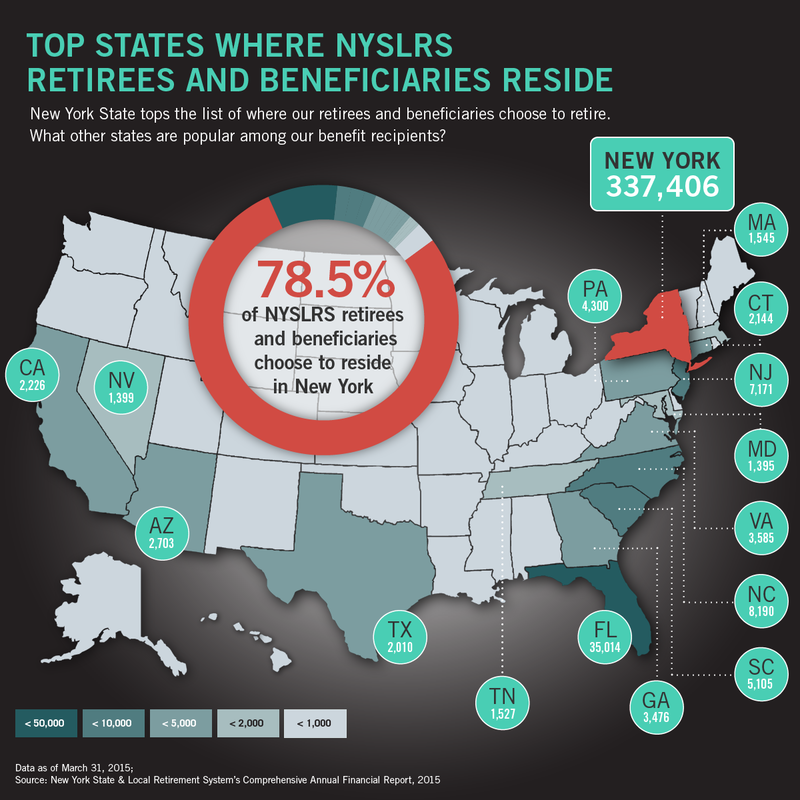 All told, 429,591 NYSLRS retirees and beneficiaries live throughout the United States and its territories. 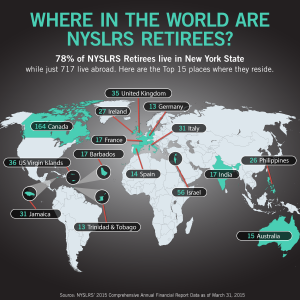 Whether you retire close to home or move away, you’ll always be a part of NYSLRS. Make sure you stay in the loop about your benefits by visiting our Retirees home page. Content last revised January 6, 2016. This entry was posted in General News, Retirees and tagged CAFR, Canada, ERS, International, Israel, Italy, Jamaica, members, New York State & Local Retirement System, NYSLRS, NYSLRS Retirees, NYSLRS Retirees Abroad, NYSLRS Retirees Around the Globe, NYSLRS Retirees in the United States, PFRS, Retirees Abroad, Retirees Contribute, Retirees Create Jobs, United Kingdom on January 6, 2016 by NYSLRS.